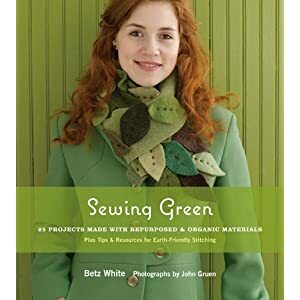 “Sewing Green: 25 Projects Made with Repurposed & Organic Materials“, written by Betz White, provides projects for people who are on a budget. This book is great as it helps craft lovers source garments, knitting yarn and other projects for their home. Eco-friendly (green) clothing designers should take note of Whoopi Goldberg’s quote: “That’s the thing about Mother Nature, she really doesn’t care what economic bracket you’re in.” If only these eco friendly clothing designers made it more affordable for low income families. Buying eco-friendly fabrics/accessories to use for your sewing projects doesn’t need to be an expensive hobby or passion. For those families who think they can’t afford to get creative, think again. Where to join eco-friendly craft workshops in the U.S. Organizations that check for harmful substances in the making of textiles. “Sewing Green: 25 Projects Made with Repurposed & Organic Materials” can be purchased on eBay. Betz’s suggestion for those consumers on a tight budget is to buy garments which have already been worn and sent to charity stores such as Good Will and The Salvation Army. This is a great way for families to save money. Preferably, I would look for used garments made from natural fibers and are naturally dyed. Fabric.com have a selection of new eco-friendly fabrics at reasonable prices. They sell organic cotton fabric, organic quilting, organic yarn, Kyoto bamboo and Soy Soft Soy Blend Batting Queen 90”x 108” made by Moda Fabrics. They also sell Genuine Coconut 1 1/2” Coconut Buttons made by JHB. 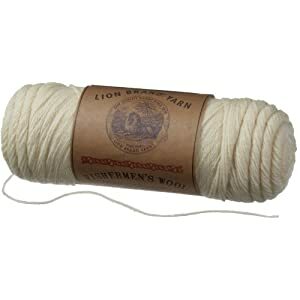 Lion Brand Yarn Fishermen’s Wool Yarn, made by the Lion Brand Company, is sold on Amazon. Authentic 100-Percent Pure Virgin Wool with natural lanolin oil is soft and warm; ideal for ski and fisherman sweaters, hats, scarves, throws etc. This yarn is great for felting once it is machine washed. To find brand new eco-friendly fabrics/accessories, Fabri.com sell these in their eco-friendly organic boutique section. They offer free shipping on orders $35+ for U.S. residents only. Looking for something in particular? Then Erin’s Eco List will do the searching for you.